Chocolate, marshmallow and many jelly candies will melt at temperatures above 75 degrees. During hot weather one or more Ice-Brix refrigerant gel-packs will be added to your order at no additional charge. If necessary we will use a cooler box, also at no additional charge. The Old Time Candy Company is located in and shipping from northern Ohio. 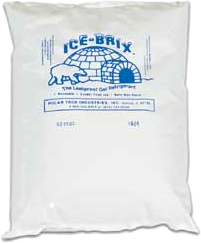 Ice-Brix are reusable and work well for picnics, camping and sprained ankles. Ice-Brix are NOT for human consumption. Shipping delays are possible: Ice-Brix may delay your shipment. We will ship your candy to arrive by Friday of the same week in which your order was placed. If arrival by Friday is not possible, your order will be held until the following Monday to prevent melting in a hot UPS truck over the weekend. If your candy order is delayed we will send you an email notification within 1 business day. If this is a "candy emergency," please call 1-866-929-5477 during east coast business hours to place your order by phone. Leave a message if the line goes to voice mail. If possible, ship to a business location or place where someone will be available to accept delivery. Please remember that UPS does not deliver on Saturday or Sunday. Upon receiving your candy order we suggest that you bring it into air conditioning if possible. If not, put the candy into a refrigerator before opening. The purpose of Ice-Brix is to keep the candy from melting, NOT to keep the candy cold. Click here for a US temperature map in a new browser window. APO & FPO orders - Ice-Brix will NOT last long enough to protect your candy. You are shipping at your own risk.